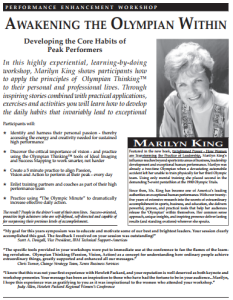 In this highly-experimental, learning-by-doing workshop, Marilyn King shows participants how to apply the principles of Olympian thinking to their personal and professional lives. Through inspiring stories, combined with practical applications, exercises, and activities, you will learn how to develop the daily habits that invariably lead to exceptional performance. 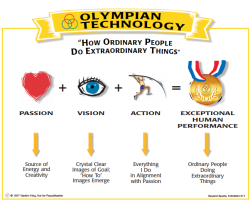 Begin Your Day the Olympian Way for accelerated leadership development. Know what to focus on and how to focus with this guided imagery audio program. Like an athlete in training, Olympian Thinking requires practice. Be supported in your most important daily practice and map your progress throughout the year. Here is my favorite online coaching tool by Essi Systems. Receive your exclusive discount through Way Beyond Sports. Standing ovations are a common response to Marilyn's keynotes, workshops, and trainings. Contact Marilyn directly or explore the "Business" section of our website to see current topics, clients and feedback. Click Here To Learn More.